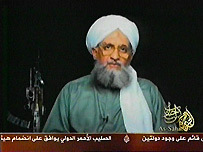 Al-Qaeda's second in command Ayman al-Zawahiri has called on all Afghans to resist the foreign forces in their country. In a videotape broadcast by al-Jazeera TV, but which appears to have been recorded on 30 May, al-Zawahiri condemned the deaths of Afghan civilians in Kabul at the end of May, when a crash involving a US military convoy followed by protests left more than a dozen people dead. The following are excerpts from the videotape. I address my statement to my Muslim brothers in Kabul, who lived through the bitter incidents yesterday and saw with their own eyes fresh proof of the US forces' crimes against the Afghan people. My Muslim brothers in Kabul, the latest US aggression against you was preceded by a long series of killings of innocent people in Kabul, Khost, Uruzgan, Helmand, Kandahar and Konar. This aggression was also preceded by the torture of Muslims in Kandahar and Bagram and the prison of darkness in Kabul. It was also preceded by insults to the holy Koran in Bagram and Guantanamo and by the Danish, French, and Italian peoples' mocking of the most noble Prophet, God's peace and blessings be upon him. Yesterday's incidents were also preceded by Clinton's and Thatcher's honouring of Salman Rushdie, rewarding him for offending the Prophet, may God's prayers and blessings be upon him, and his holy household. I appeal to Muslims in Kabul in particular and throughout Afghanistan in general, for the sake of God, to sincerely stand against the infidels' forces, which are invading Muslims' lands. These forces filled Kabul's sky with their flags of every colour and shape. I appeal to my Muslim brothers in Kabul in particular, and throughout Afghanistan in general, to defend Islam. I also appeal to them to glorify the great Koran and love the noble Prophet, God's peace and blessings be upon him. I urge them to demonstrate chivalry, gallantry, and pride. I urge them to demonstrate the Afghan people's zeal and dignity, and their rejection of injustice. I also urge them to remember the history of their fathers in resisting the invaders. I urge them to do that and to resist this infidel, oppressive, and unjust occupation of Muslims' lands. I appeal to the young people of Islam at schools and universities in Kabul to carry out their religious duty in defence of their religion, honour, sanctities, and homeland. Do not trust those infidel invaders or their treacherous agents, who want to turn you into a humiliated and enslaved people in order to achieve their ambitions and gains. My Muslim brothers in Kabul in particular and throughout Afghanistan in general: Stand by the mujahideen until the invading forces are expelled, Muslim Afghanistan is liberated, the glorious Sharia is implemented, and sanctities are preserved and until security and justice prevail.